Friday, January 30: A rufous phase Screech-Owl can often be seen peering out the nest box located in front of the nature centre. The best time of day to see the owl is after 5:00 pm but some days it will be at the entrance hole through much of the afternoon. Saturday, January 24: The Nature Centre's Little River birding trip found most of the Detroit River ice covered but there were good numbers of waterfowl in the open channel next to Peche Island. Canada Geese, Common Goldeneyes, Canvasbacks, Redheads, Buffleheads, Common Mergansers and Mallards were present. Other sightings included several Mute Swans, 2 Red-breasted Mergansers, 2 Hooded Mergansers, a few scaup of both species and one adult Bald Eagle. The best viewing locations are at Lakeview Marina and Sandpoint Beach. The open water in Little River by the Pollution Control Plant had hundreds of Mallards, several Black Ducks, Gadwall, a male Wood Duck and one Great Blue Heron. A very cooperative Long-eared Owl was found roosting in a small tree along the walking trail behind the toboggan hill. Saturday, January 10: The extreme cold (-18C) did not deter ten people from Ojibway's field trip to Point Pelee and Jack Miner's today. The tip area of the park was a striking sight with mounds of ice. Highlights today included 15 Rough-legged Hawks hunting over the Pelee marsh, 4 Northern Harriers at the tip, a Chipping Sparrow and 7 Snow Geese (3 white phase, 4 blue phase) at Jack Miner's. Other sightings included American Kestrel, Red-tailed Hawk, Cooper's Hawk, Red-bellied Woodpecker, American Robin, Eastern Bluebird, Cedar Waxwing, Common Grackle, Swamp Sparrow, White-throated Sparrow, American Tree Sparrow, Song Sparrow at Pelee, and close views of Horned Lark, Pintail, Mallard, American Black, Wood Duck and Redhead at Jack Miner's. Yesterday Ian Woodfield reported a North Shrike at Little River (near John's Pond). Saturday, January 03: The very mild weather has produced scattered sightings of dandelions and forsythias in flower, dew worms actively feeding on lawns at night, Eastern Garter Snake and calling Chorus Frogs. Winter is due to return on Sunday. Friday, January 02: Twenty-six people participated in yesterday's Detroit River Christmas Bird Count. The Canadian side of the count recorded 60 species plus 4 for count week. The complete results are listed on the Detroit River CBC page. One highlight was the discovery of a pair of adult Bald Eagles at Fighting Island. One bird was perched on a large stick nest leading to speculation that the pair might nest on the island this spring. Six pairs of eagles nested in the region last year. 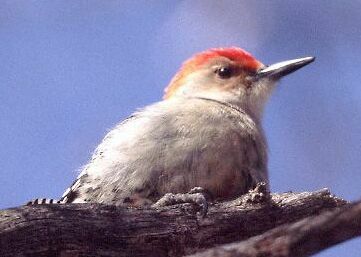 Red-bellied Woodpeckers and Carolina Wrens were recorded in record numbers during the count.